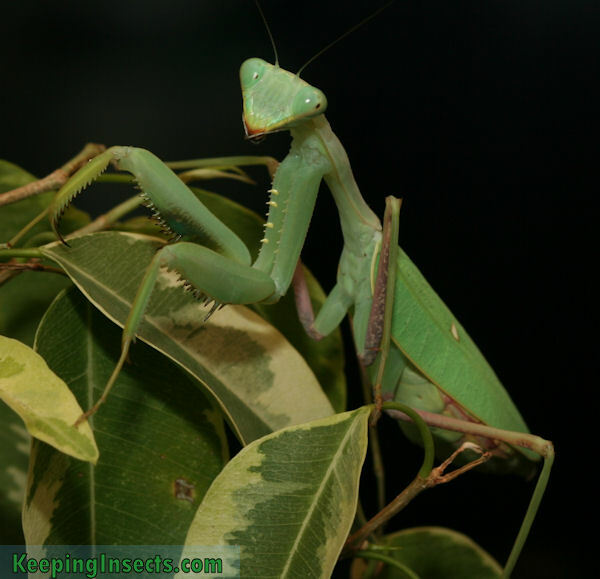 Praying mantids of the genus Sphodromantis are among the most commonly kept praying mantis. Most people keep Sphodromantis lineola. The species of this caresheet, Sphodromantis baccettii, is uncommon as a pet. Sphodromantis lineola is similar to S. baccettii in care and size, but there are some differences in coloration. Sphodromantis baccettii is endemic to West Africa. 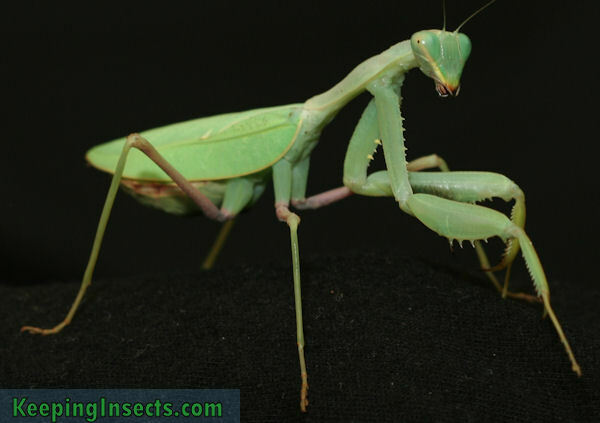 This species of praying mantis is almost always green. Sometimes one can find a slightly more yellow-green variety, but I did not observe any brown color variety in this species. Sphodromantis baccettii females are about 8 cm long, the males with their 6 to 7 cm are smaller. The adult males are thinner, lighter and have slightly longer wings than their abdomen. The adult females are larger, heavier, broader with wings that extend just to the end of the abdomen. On their wings they have a small yellowish dot. 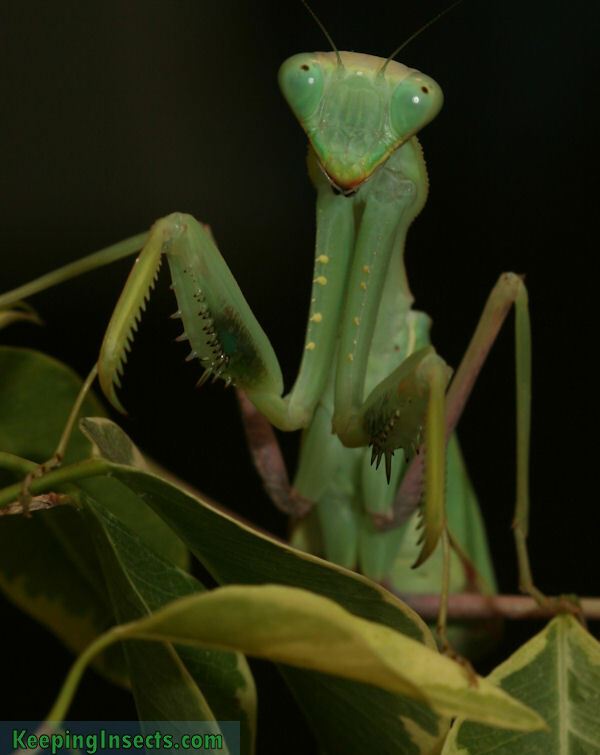 Sphodromantis baccettii is a fierce kind of praying mantis. They actively chased after their prey once they are aware of it walking or flying around them. This species is not quickly intimidated by prey or people and can eat large prey without any problem. The ideal temperature for S. baccettii is about 25 ° C, but a temperature between 21 and 30 ° C is just fine. At night the temperature should be at least 17 ° C.
This species has no high demands on the air humidity, but it is important to spray with water about 2 times a week. This will allow you mantis to drink. A target air humidity is about 50%. 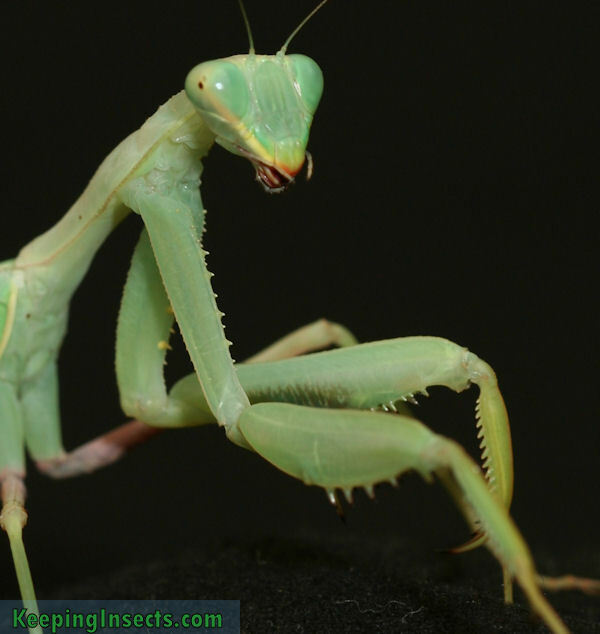 As with all species of praying mantis, this species needs a cage that is at least 3 times the length of the animal is height, and at least 2x the length of the animal in width. For an adult this means is at least 24 cm in height and 16 cm in width. Suitable dimensions for a terrarium would be 30 x 20 x 30 cm (h x w x d), so there is place for lots of fake plants and perches. To read more about safe housing, read General Insect Enclosure. Because Sphodromantis baccetti is such an active predator, it is not adviced to keep more than one mantis in one enclosure. Sooner or later one will eat the other. The bigger and older the mantis, the greater the chance of cannibalism. Nymphs can be kept together to around L4 when space and food is ample. The females of this species are larger and broader than the males when adult. When the mantises are still nymphs, you can distinquish the sexes by counting the number of segments of the abdomen. From around L4 (fourth instar) you should be able to see this. Females have six segments while males have eight segments. When the nymphs grow older, you can also start to notice that the males have a less broad body and have bigger and thicker antennae. Approximately 2 to 4 weeks after both partners reach adulthood, a mating attempt could be made. (General breeding tips here) Make sure that the female eats very well before you introduce the male to her. The female can be very aggressive to the male, so keeping her occupied with a big prey item will help the male. Mating can take several hours, try not to disturb the pair during the mating. After mating the male should be removed from the enclosure, because he is in danger of being eaten.